The market ended the month at a 3 year high and everything is bullish right now. I happen to own Gold and Chinese currency and that has been doing extremely well as well. So from the technical perspective, I think we should assume a continued rally possibly into the summer before any significant correction. From an EW view, there are several ways to count this wave in the intermediate term but from the short term perspective this can't go on much longer without at least some sort of drop. 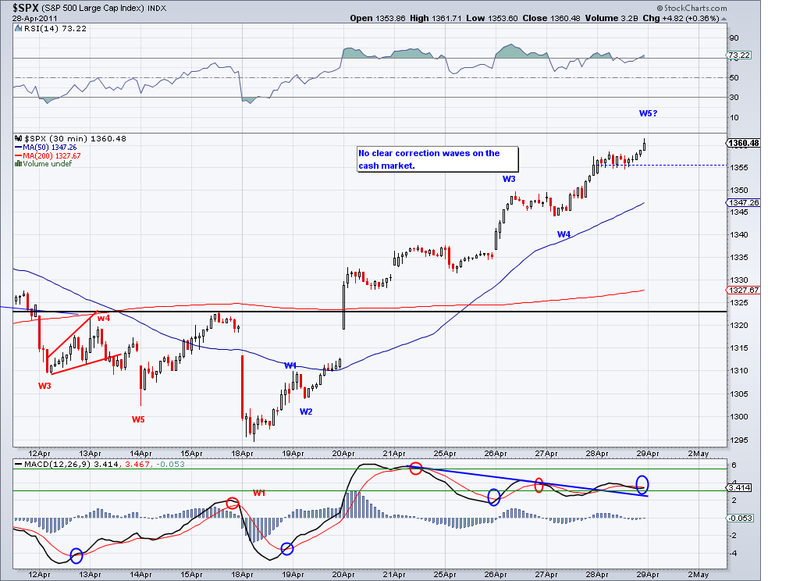 Indicators are all overbought, so it favors a pullback Monday. Also, there hasn't been a single rally where there were more than 4 white candle days in the last 8 months so that also favors a pullback Monday as well. I drew a channel on the chart where the market could find support in the event of a pullback and I will be going all long at that level. As of today, I sold the hedging position from yesterday at 1363 and I am net short. 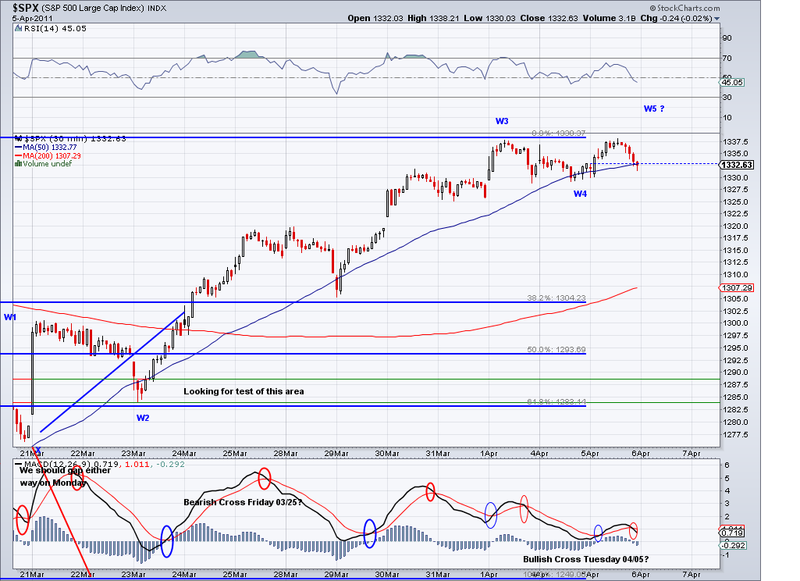 And btw, the market almost reached the 1370 target I had for April. So I just have to extrapolate some of the data to get to a May target and I will post that Monday. Have a great weekend! 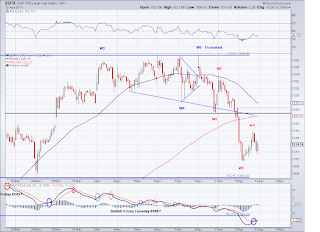 I think the last time I saw a wave like this was the break out wave from 1040 back in early September 2010. The market is showing a lot of strength and all assets are going up across the board. And I think the message is clear, people are going to move away from holding cash (In US dollars) and try to hedge against the dollar's depreciation by going into commodities, precious metals and equities. And in the not too distant future, everything we import (and items that are priced internationally such as corn) will see a big increase. So the plan is to go long in the first pullback on foreign equities, oil and some commodities on the rest of my portfolio that is sitting in cash. I went hedged today as the count has become unclear at this point. The E-minis have a better count but the cash market looks like a rocket so I am not going to make predictions based on waves until I see something clear. 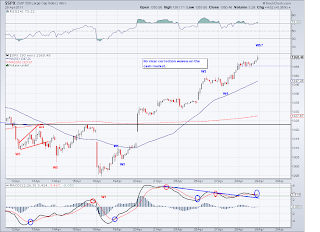 The daily RSI is at 70 and many indicators are overbought which favors a pullback. But overbought can get even more overbought, so I'll just wait it out. The market is definitely breaking out of the triangle at this point and it seems to me like we're in for a bullish year regardless of oil, possible recession or whatever as this is a rally being fueled by the Feds. I was expecting a pullback today but almost every pullback recently has been around 5 points so it's tough shorting this wave. I am still holding my shorts as I think we will correct to the TA eventually but it is going up fast so this correction better come soon. Everything is bullish now I am just waiting for the correction to get back in long. As far as the wave count, the entire wave from 1294 could be considered a W1 of a larger degree and it is running out of waves at this point if we were use basic EW counting guidelines. 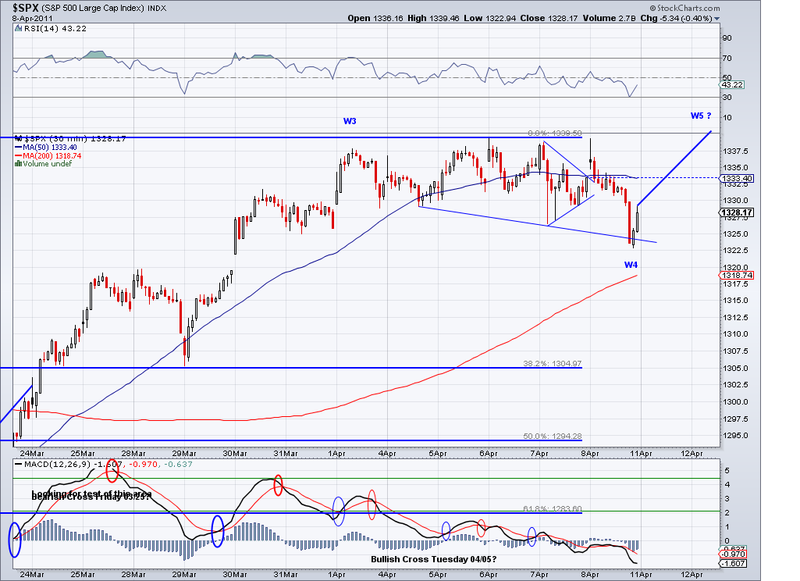 The next resistance is 1261 so let's see if it makes it there. 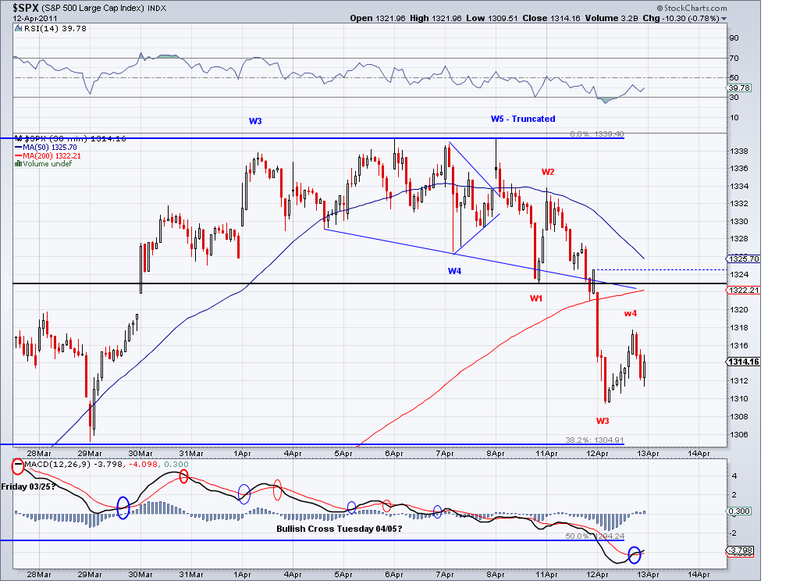 It seems like the 1370 target I had posted on the 1st of the month is within range. Break out or is this it? The market traded higher as I expected on my post yesterday and it'll be interesting to see if what we saw today was the beginning of a break out or the top for this wave. I expected resistance to be tested and today we did but the high makes me suspicious. If this was a stock, I would assume it is breaking out. But since we're dealing with an index, I favor a correction starting tomorrow or the day after to test the TA/rising trendline and then go into a W3 that will blast past resistance. 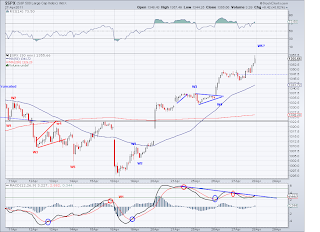 There is a bearish MACD cross and the Stochastics also favor a pullback. 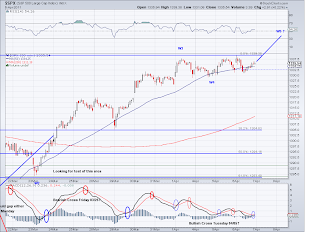 I shorted at resistance (1345) today and I am hoping to cover at the retrace of this wave, ideally in the 1325 area. And unless the market falls off a cliff there, I will be going long there to ride the coming bullish wave. 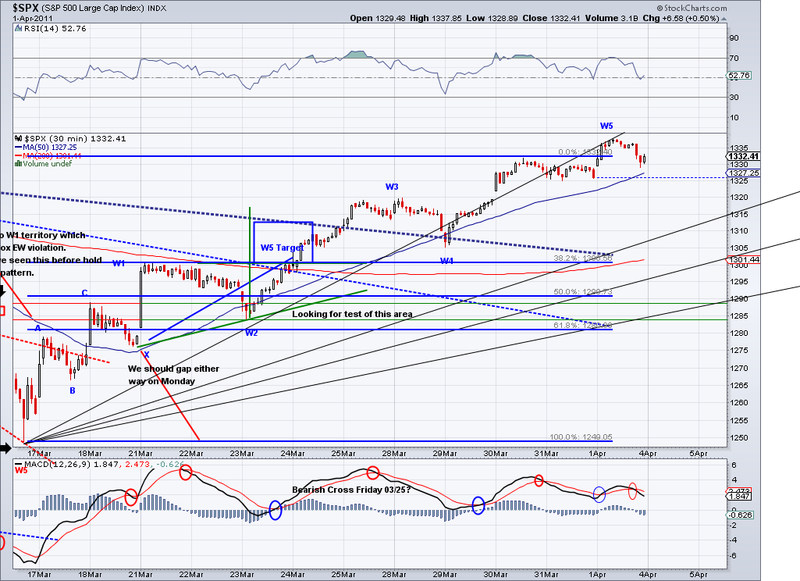 The market didn't really do much today and it seemed like a Wave 4 in progress. So the 5 wave count I had on Friday could probably be a 5 waves within a 3 Wave and we're consolidating here for another bigger push. 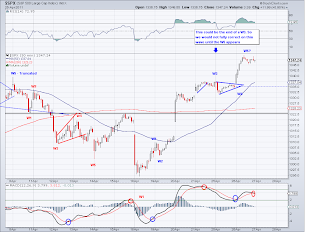 Also, the market is staying inside the potential Ascending Triangle I posted last week and it could break out from this pattern on the next push. I still favor a push to test resistance or make a marginal new high and then go into a correction to test the TA and/or the rising trendline on the Ascending Triangle before breaking out. I closed my short position today at a minor profit and waiting to see another bullish wave to short or the correction to go long. On a side note, I twitted an article on China pursuing diversification of their holdings into Gold and Oil and that supports the view of much higher prices in the longer term. The thinking is the dollar will continue to lose purchasing power and countries around the world will follow in parking their money in commodities and precious metals. Which in turn, will drive prices not only to new highs but maybe even create a bubble in this asset class. Gold has gone up 10% since I posted the buy signal in February on the blog and I will add Oil and silver entry points on the next pullback. In the future, I will cover these trades as it seems like we're about to see a major bullish wave on them. The market continued its way up today and it came very close to the high for the year in afterhours. However, the cash index did not produce the same levels and it seems to me like the wave has topped or will top on Monday morning as I see 5 clear waves from the 1294 bottom. 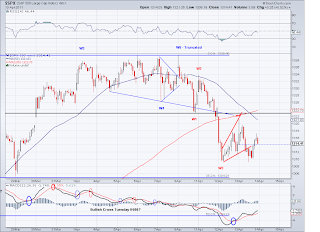 This close turns the short term trend bullish so the next bearish wave should show where the market is headed next. If the market retraces to a Fib level in an non impulsive manner and closes above the TA, then it will be time to go long as the market will be in for another bullish wave. The only thing that could change the bullish scenario at this point is a major sell off on Monday that shows this last leg was just a C leg of an expanded flat. But given the fact oil, commodities, precious metals, etc. are rallying, it seems to me like this is a rally tied to the weakening dollar and thus the main driver for higher prices is the perception that the US dollar will continue to depreciate. 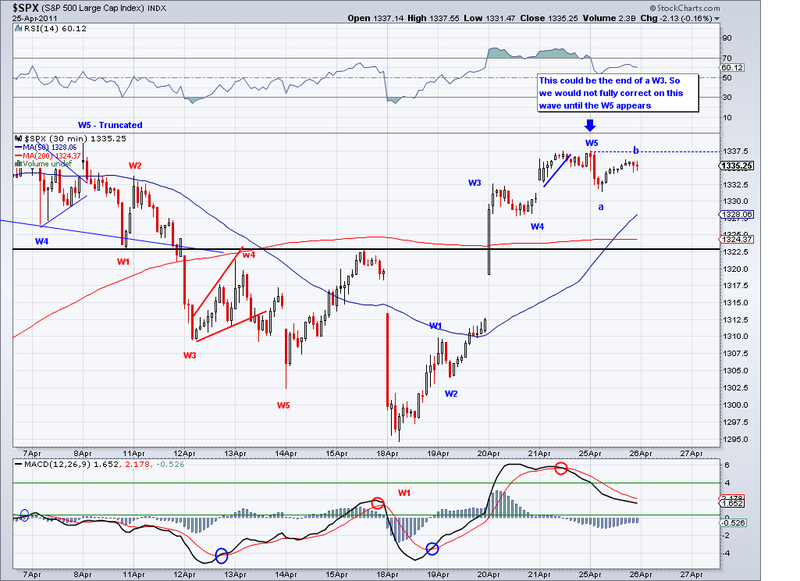 I went short today at the end of what I see as 5 waves and other TA factors. I figure this is a lower risk/high reward situation at this point. And if we just get a correction, then I will be all in long. I have most of my portfolio in Chinese equities, Chinese currency and Gold and that's about 50% of my holdings. And the other 50% is in dollars (cash), which I intend to switch away from since we will see the dollar at an all time low fairly soon. I was expecting a gap up today but nothing like we saw this morning. All the near resistance levels were broken and so was the TA so this could well signal a change of trend if the market does not reverse hard in the next couple of sessions. 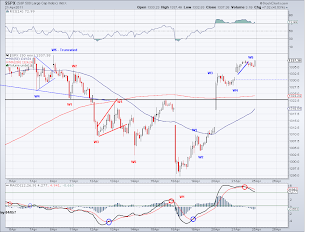 The wave we saw today was a W3 of some kind and the closing being a W4. 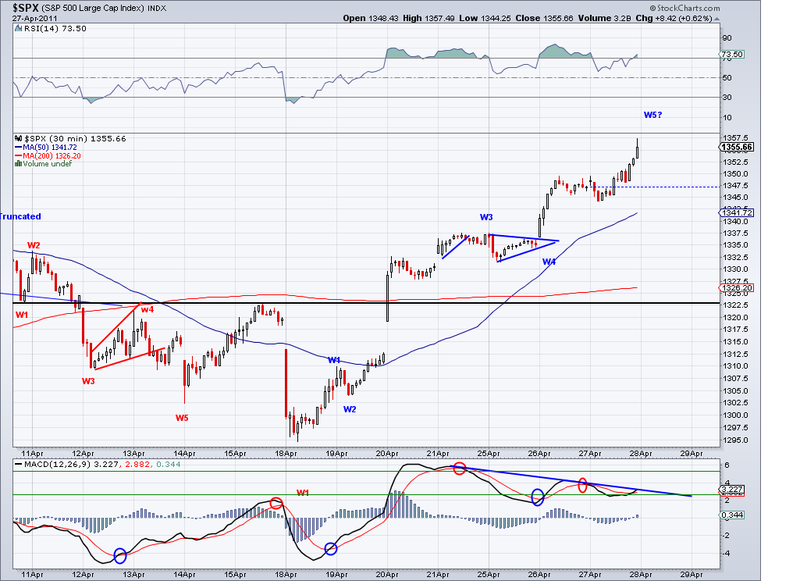 So I expect a W5 after hours or tomorrow and then a sell off or correction. I think how the market behaves at the TA/support will give us a clue of what we are in for. Today I posted two charts. 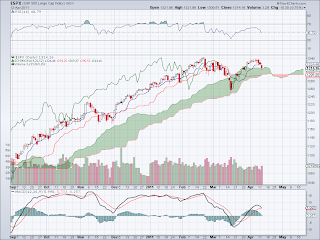 The first one is an Ichimoku chart and it signals a bullish turn in both clouds and candles. Also, we now have two very bullish technical patterns. We have the Inverse Head and Shoulders in place targeting 1500 and the potential Ascending triangle targeting the same range as well. So if the next bearish wave turns out to be just a correction, then we're on to a massive bullish wave on a break out of this triangle. 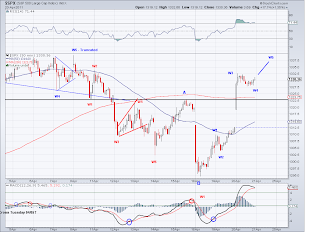 The second chart is the EW chart and I still have the bearish option up because the short term trend is not confirmed bullish. So I am labeling the only bearish way possible which is an expanded flat. If this is the case, then we enter into a major sell off in the next session or two simple as that. I plan to short this wave at resistance which should come in at 1339 or 1344 and I expect the wave to test the TA or come close to it at the very least, which is currently at 1318. Shorting in a bullish trending market is very risky. So if you're a short, make sure you are not holding against the trend. The market retraced higher as I had been expecting on this wave and it seems like we will see a gap up tomorrow to test resistance. 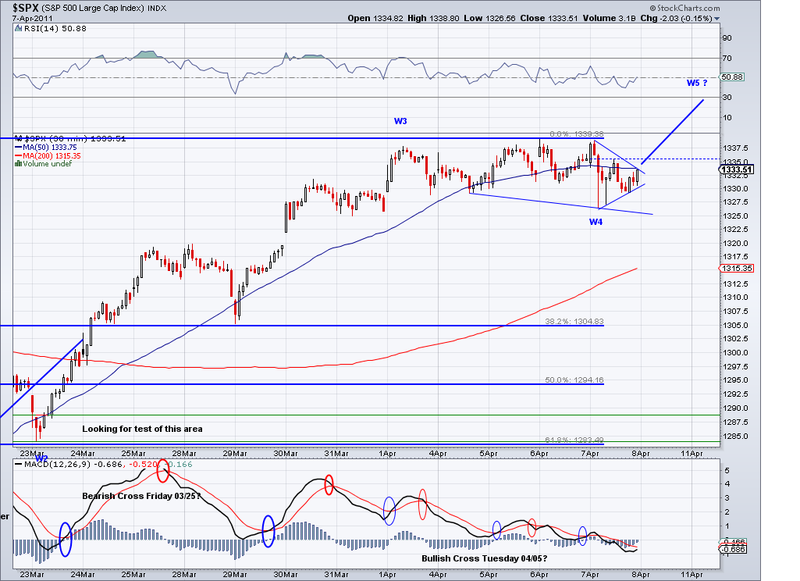 The levels to watch are 1316 and 1322 and I am assuming we will see more selling after these levels are tested. 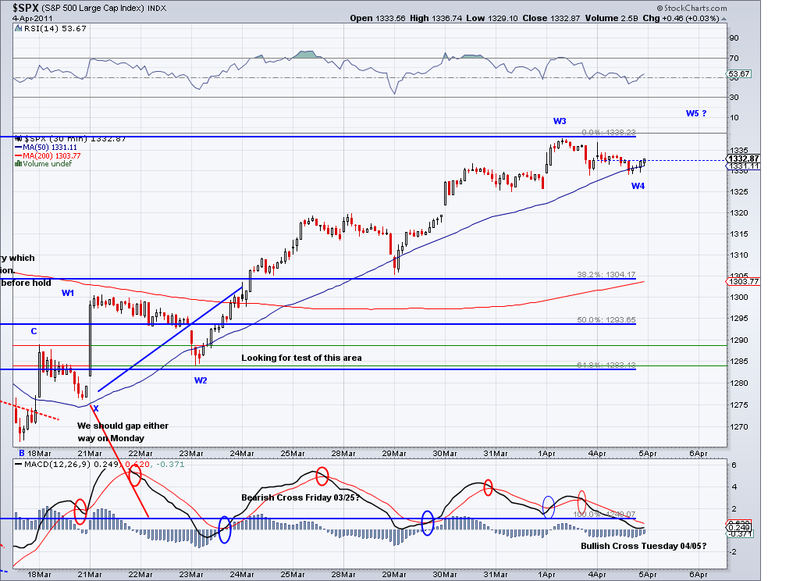 The TA is currently at 1318 so I expect the market to gap up (or run up) above it but reverse and close below it. 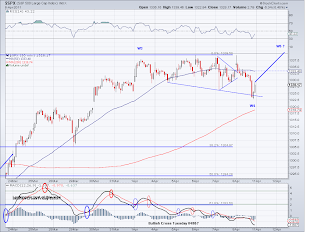 Any closes above the TA turns the short term trend bullish again so if you're shorting keep an eye on it. I am still in cash and waiting for the right moment to get back in on the short side. The downtrend resumed today in full force as I assumed on Friday's post and we now seem to be on a W2 counter rally(although there is also the possibility of a W5 leg down to 1288-1293 coming tomorrow before the W2 counter rally). Technically the market could continue the sell off tomorrow in a W3 as the rally has already done a proper Fib retracement. But since we have a bullish MACD cross, I think it has a good chance of bouncing to resistance at 1316 and then resume the sell off in a strong bearish wave. 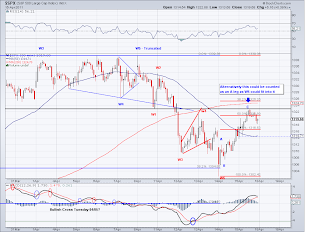 The short trend started turning bearish last Monday and now the intermediate trend is also turning bearish. I set my buy trigger to play the W2 bounce at 1293 but unfortunately the market made it only to 1294 (I am stingy when it comes to buying and my stop losses). 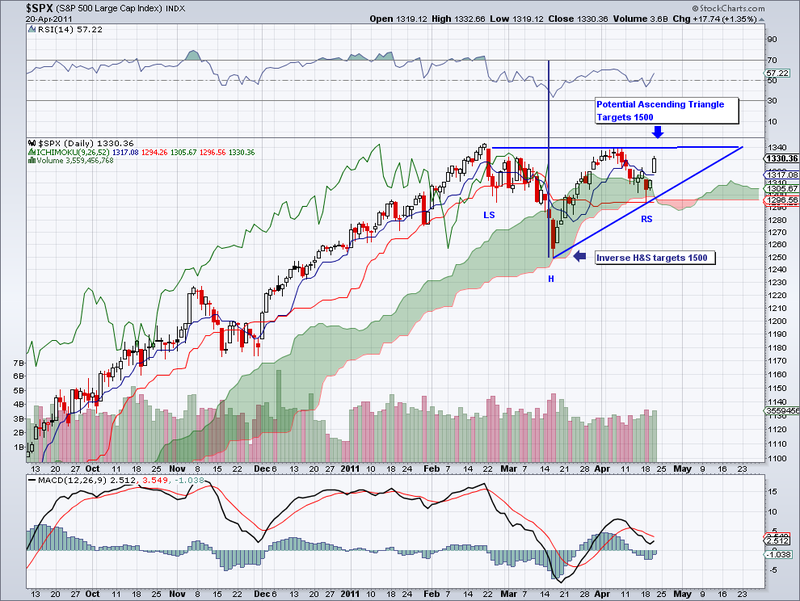 So I'll see if I can catch the market on the next bearish wave which should be coming in the next couple of days. Interesting how the market sold off on the S&P downgrade, as if this debt problem was somehow "news". If the US was a person, the level of debt and deficit spending would equal to a person that nets $100,000 owing $1,000,000 to creditors while continuing to spend $170,000 per year. Doesn't take a genius to figure out there is a big problem but as long as people buy our debt, we'll just keep printing our way out. 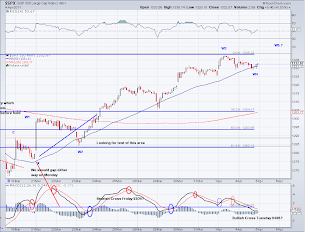 The market reached the 1320 level I posted yesterday and it made the high exactly at the 1322 level where I expected the market to find resistance. And now I expect the downtrend to resume on a C or W3 wave next week and then we will see if the market wants to go down to test the 1249 level. However, I should point out that the wave from 1302 to 1322 could be changed into a 5 wave structure so maybe the entire move is not an ABC as I have it's labeled but just the A leg on it own. 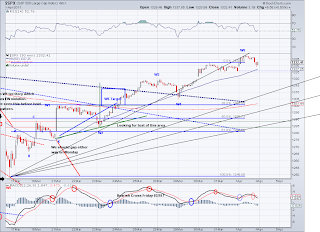 And if that is the case then the next wave would probably test the 1302-1311 level and then go on a C wave to re-visit the 1320 area. The trend remains bearish and the only thing that could change it would be trading and closing over the TA. I sold all my longs at 1319, shorted at 1322 but took profit at the close. I am travelling at the moment so I don't want any weekend surprises. I will profit as a short if Monday comes and we test the TA again or on the long side after the next bearish wave is done. The market gapped down in a W3 of a W5 as I speculated yesterday and it paid off to wait. I entered long positions at 1303, sold at 1312 and bought back at 1308 and now holding overnight. 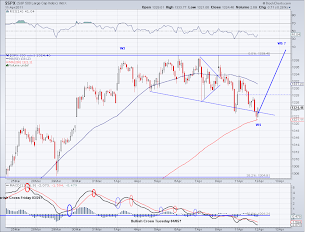 I am expecting this wave to test the 1320 area. 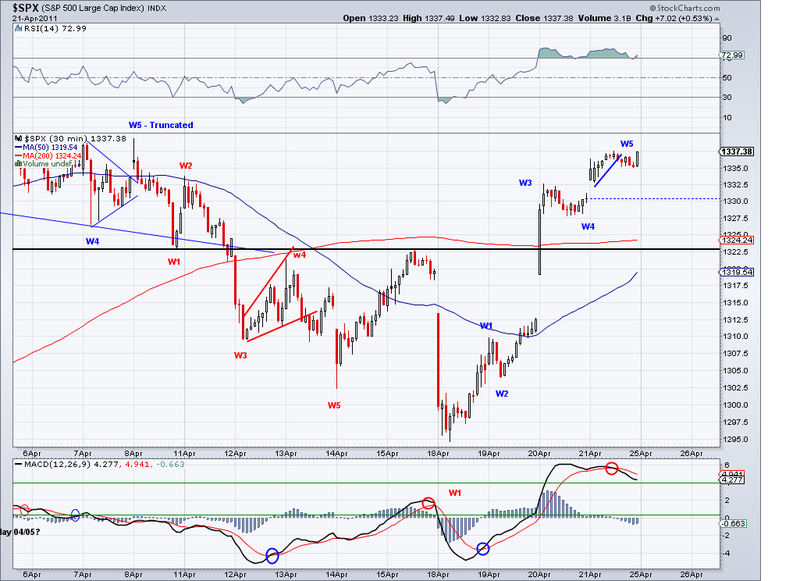 However, there is a chance 1317 is as far as it will go so I have to see how the market opens tomorrow. The 1322 level will be resistance and will coincide with the TA, so that will be the ideal level to sell all longs and then wait for the next leg down or even load up on some shorts. What remains to be seen is how low the market intends to go, this correction could end this week or could be the beginning of something bigger. Today the market bounced as expected and it continued to sell off afterwards. 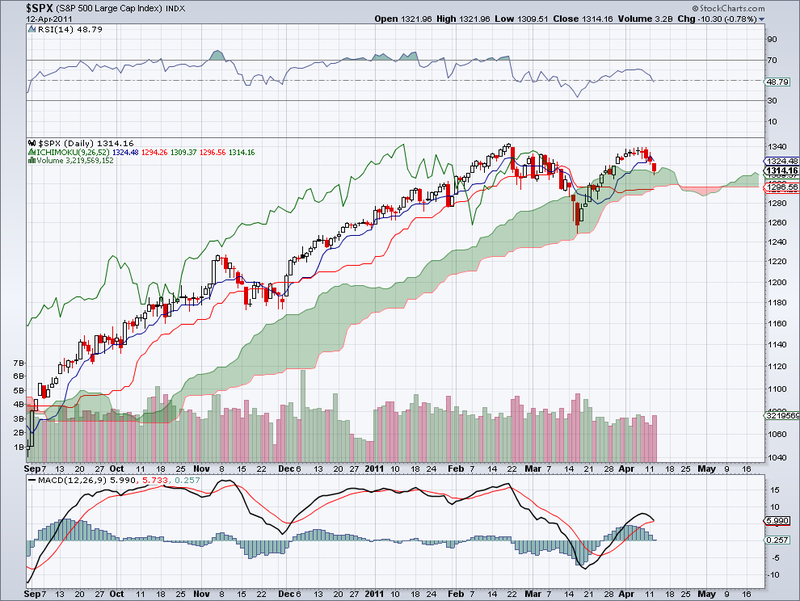 The market made a marginal new low today so this could have been another truncated 5th on the downside. 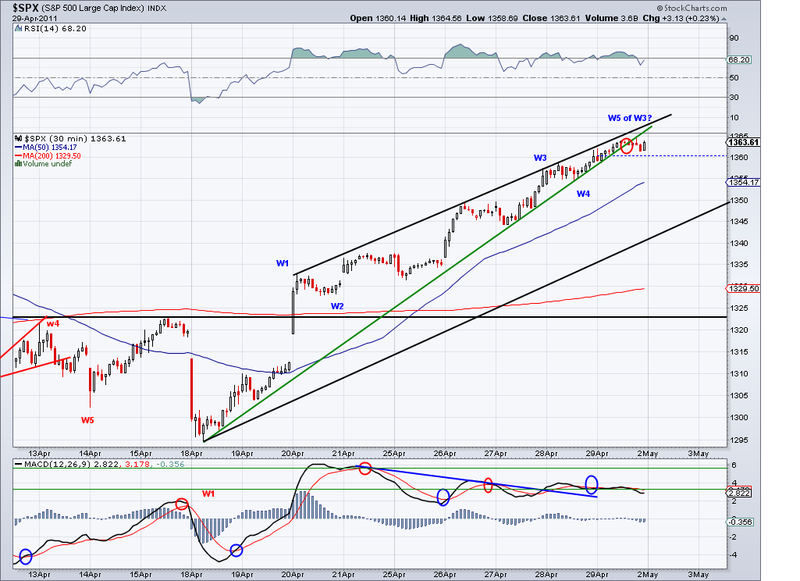 But it could well be the W1 of the bearish W5 that we saw and we could probably wake up to a gap down on a W3 of W5. 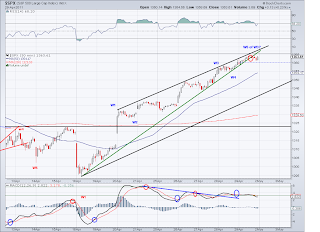 Whatever the count, the trend is bearish and I am waiting for an opportunity to come on the long side. And until then, I am in cash waiting to see what levels the market intends to test. The short term trend is now confirmed bearish so now we'll just have to see what sort of correction we are in. The count that I had been following basically ended on the day the market made the marginal high and technically is best to label it as a truncated 5th wave. I am expecting the market to test the 1290-1300 area fairly soon and if the market finds support there, we'll probably see a W2 end and then a start of a strong bullish wave to 1400. 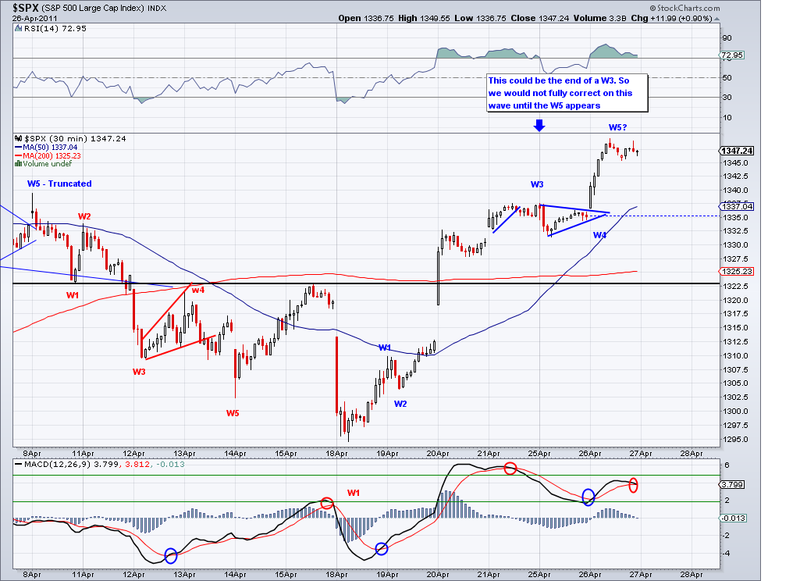 There are some EW counts that are calling for a market top. But the way I see it, this market is not pricing in earnings as much as it is pricing inflation and currency depreciation. Today's sell off was attributed in part to concerns about oil prices and commodities. Basically, the same catalysts I've been writing about for over a month. And just like there were no concerns when oil was over $112 (and now there is at $105? 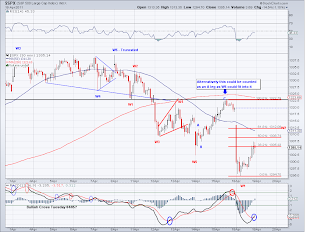 ), we'll probably see a bullish wave in equities along with oil, commodities and everything else priced in US dollars. As far as I am concerned, we are seeing profit taking and nothing more at this point. Unless we get a close over 1330 tomorrow, the short term trend will officially turn bearish and we should expect a correction of the wave that started at 1249. The count I've been posting is still valid but looking at the trend, I wouldn't bet on it at this point. 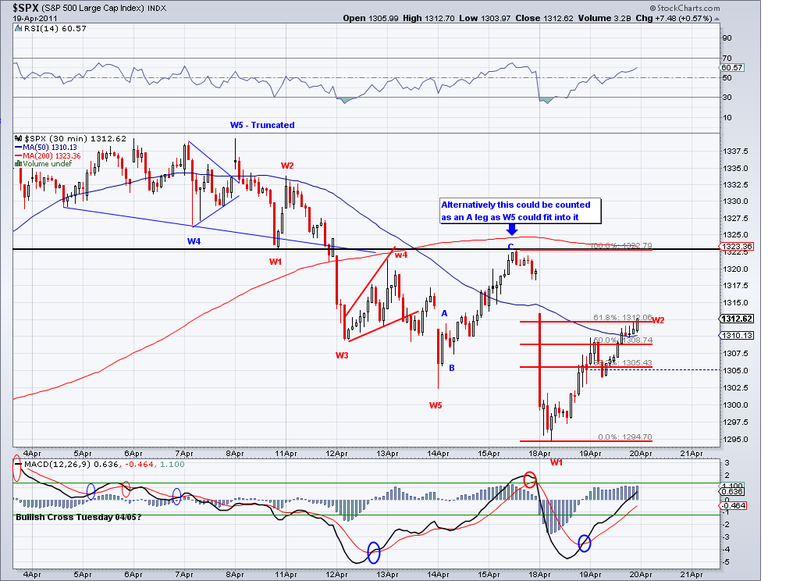 So if this turns out to be a correction, then I expect the 1290-1300 level to be tested before turning bullish again. If tomorrow turns out to be a bullish day that turns the trend back to positive, then the 1350 target is still a valid possibility for the near future. I continue to hold cash to short at the 1350 level or go long at the first sign of the trend turning positive after the coming correction. Still on W4 or has correction started? The market continued to trade sideways today but it did put in the low for the week (and a marginal new high as well) and closed under the TA, which in itself is bearish. However, this continues to look like a sideways correction and it is still valid as a W4 since the W3 that took the market to this level was a very strong one. 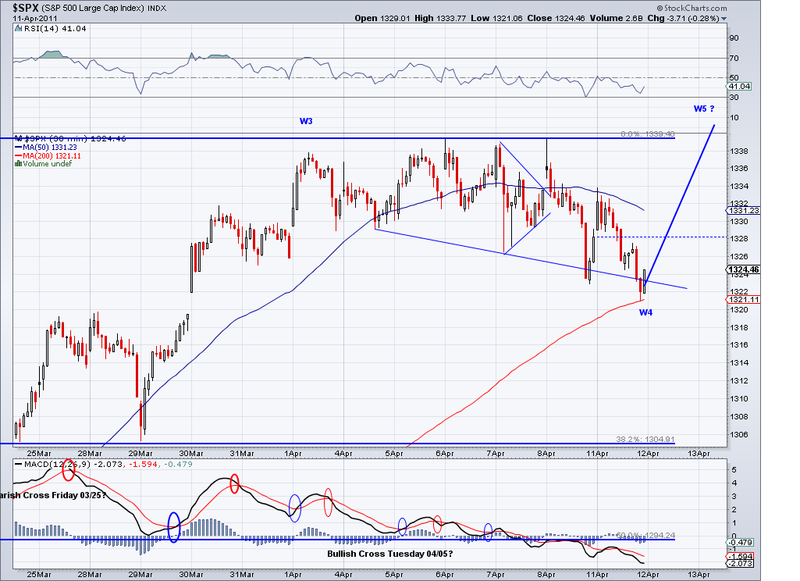 I would change my mind about more upside if the market traded under 1320. 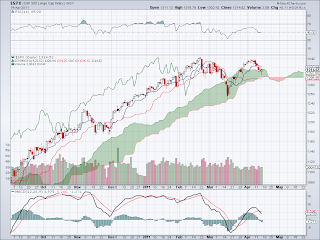 So I am waiting and hoping next week will bring more clarity to the next move the market intends to make. Oil and commodities are rallying so that adds pressure to the market, but as soon as those sectors correct we'll probably see the rally in the US markets. I am still all cash in my trading positions aside from a Chinese currency ETF I bought on margin few weeks ago, which btw is an excellent way to park cash. The market tested the TA today and bounced right off despite another earthquake in Japan and $110+ oil, which basically tells us there are not enough sellers at this level despite the bad news. So I am still waiting for the W5 to materialize perhaps tomorrow or Monday. The TA is moving up and usually there is a strong move when the market average and the TA coincide, so I am staying put and waiting for the right time to jump back in the market. The market continued its sideways corrective move today and I think odds favor a bullish day tomorrow that will challenge the high for the year. 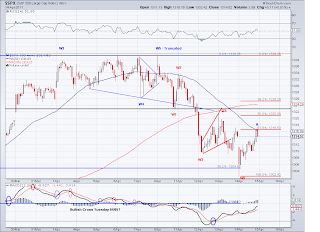 My best guess is that this wave will end in the 1355 area before seeing a significant correction. So I am staying in cash and waiting for a favorable risk/reward opportunity. I think once this wave corrects, we will a huge rally. Especially US Dollar denominated assets. New High for the Year? 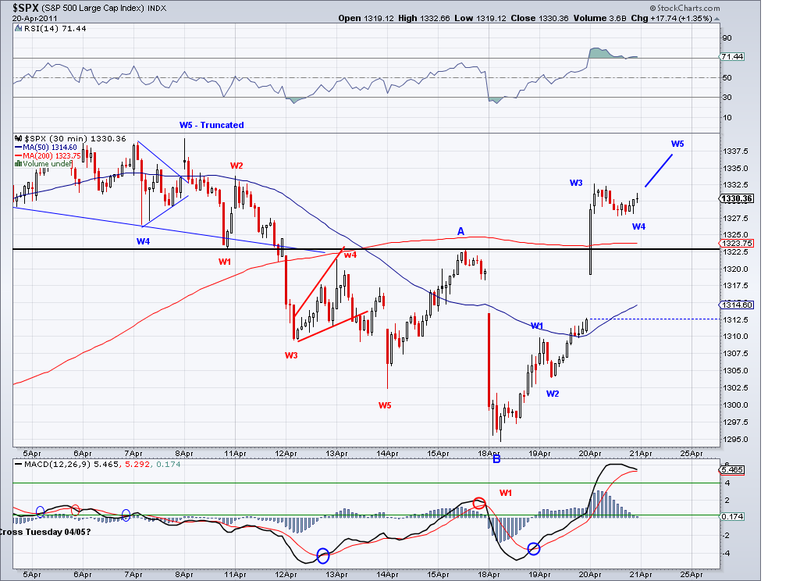 The market started its move up in what it seems like the initial 1-2 of W5. So we'll probably see a new high for the markets as soon as this week. 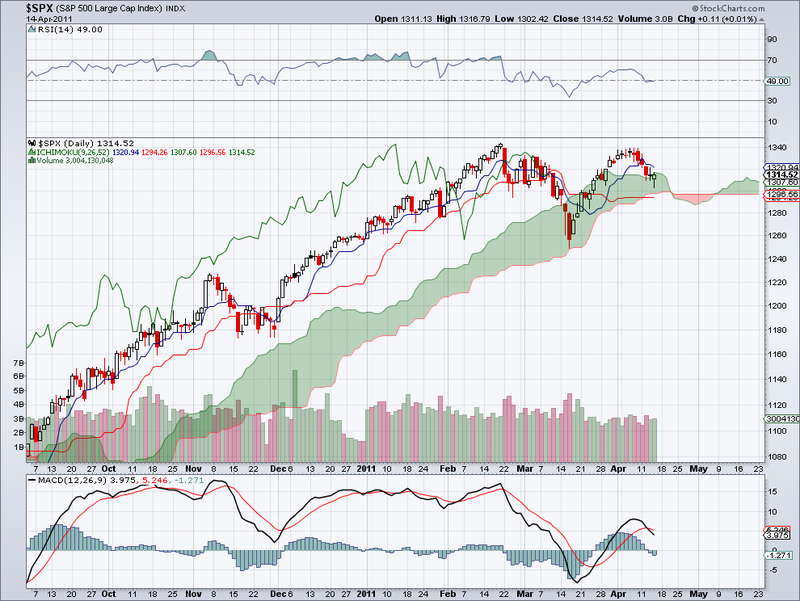 There is a bearish cross on the MACD but given the bullishness of the trend it could be quickly reversed tomorrow. I think the market continues to go up primarily because of the expected inflationary effects from it. The fact that commodities continue to go up and the dollar continues to depreciate against other currencies is a signal US dollar assets will nominally be worth more in the future. Therefore, the stock market will continue to go up just to price in these inflationary effects from the QE. 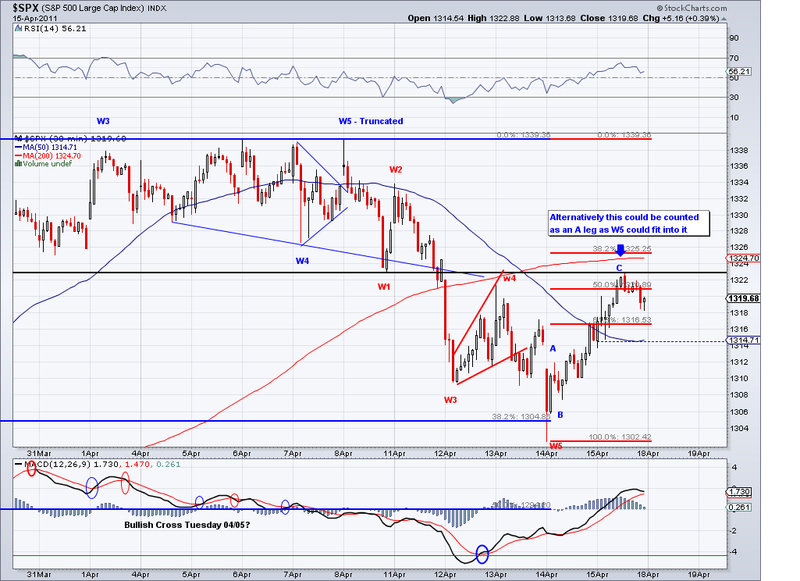 I am waiting in cash to short when the W5 is done or go long when the market retraces to a proper Fib level. I also invested 6% of my long term portfolio in Gold today as I believe it is breaking out. I re-labeled the waves on the chart to reflect an extended W3 on the rally from 1249. 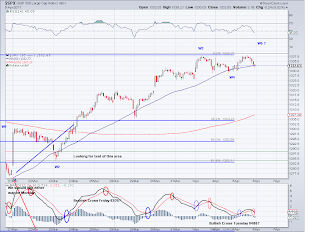 The market seemed to be in a W4 type of correction and I think we will see a rally that will challenge 1344 as soon as tomorrow. 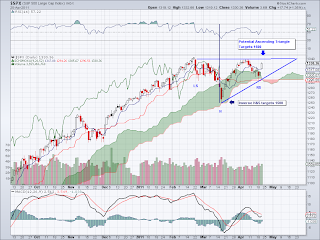 By looking at the waves, there is a good chance the market will make it to 1355 and there are bullish divergences that support this view. I think once we finish that wave, we can safely expect a 40-60 point correction. 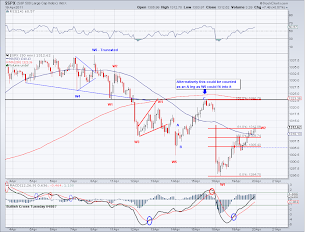 I am currently in cash waiting to short when the W5 appears or go long at the retracement. Seems like the market will not go into any significant correction until earnings season is over and official announcement of QE policy. 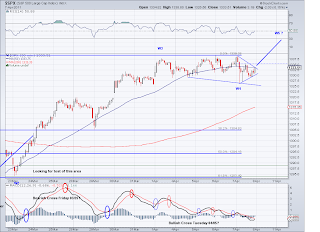 The market has turned the intermediate term bullish by breaking above the 1332 level. So now chances are the low at 1250 was just a correction of a larger degree but not "the" correction I was anticipating. 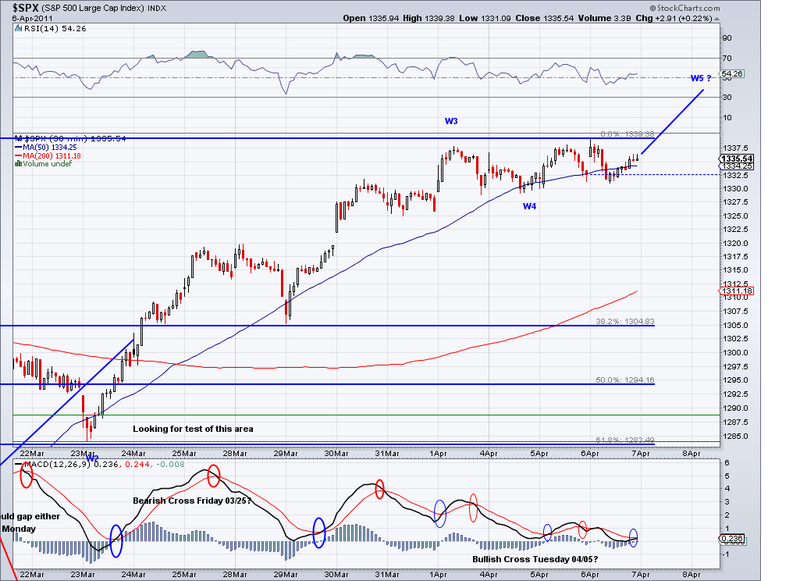 It seems like the market will continue to go higher before making a proper Fib retracement from the rally from 1040. When the correction does come, we will probably see a 100+ points move down. But in the meantime, the market will probably retrace to test the TA or even the 1300 level and then launch for new highs for the year. How the market can do this with oil closing at $108 is beyond me. Common sense would tell us that a 30% increase in oil prices in a matter of couple of months will have a big negative impact on a recovering economy. But the market is not about common sense or rational behavior, it's about sentiment and right now most people are feeling pretty bullish so no need to fight the euphoria.. if anything, it's time to join in. I traded my short positions throughout the day and made a profit from the 1331 lot. 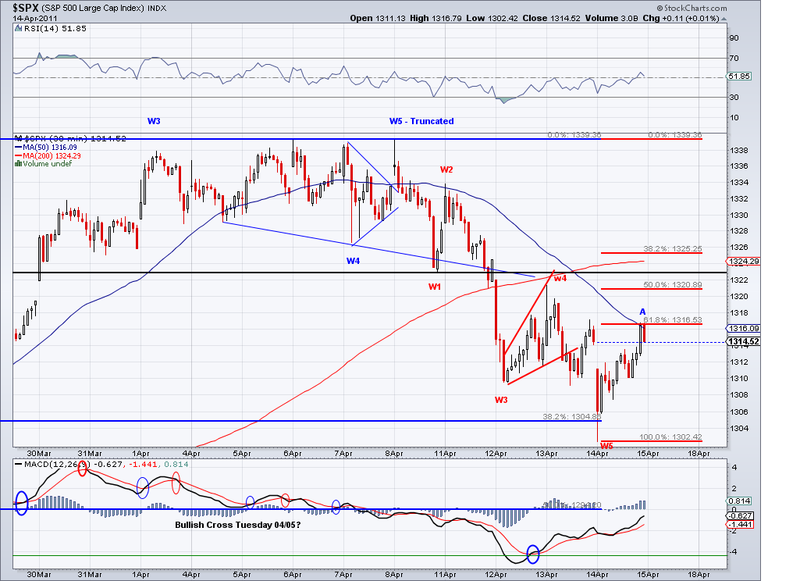 However, I lost about 20 points on my short taken as a hedge at 1308. So now I am all cash and waiting for the TA to get tested to enter long positions. 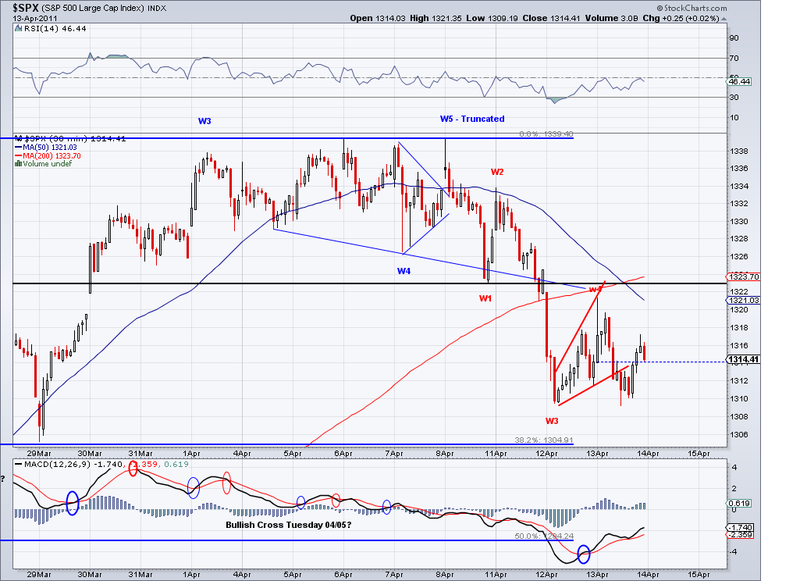 I will probably short here and there but obviously, it is a risky strategy given the bullish trend.